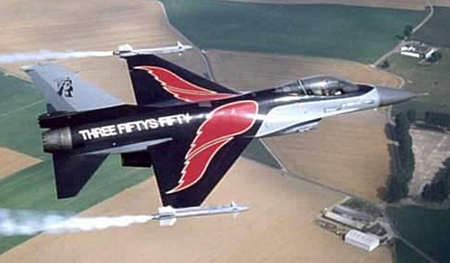 The F-16A Block 10 (short elevators) FA-50, was decorated for the 50 years of the 350th Fighter Squadron of the Belgian Air Force when it was based on Beauvechain. The aircraft is decorated only on the top, with typical red wings of the 350th (also called: mustaches of Ambiorix ) and the notation: " Fifty's Three Fifty " on the fuselage, the whole on black background. On both sides of the tail it wears the silhouette of the Gaul Ambiorix, the badge of the 350th Squadron. This very attractive decoration was maintained only a few days and remained discreet and unknown enough by the public. Thanks to Mr Jean-François Petit and Mr Alex Quimtelier for their precious help. screen-printed decals (classic decals / no-ALPS) declined on three scales.